Summer is not yet over and, as the heat turns up, people will be looking for relief. Most seek a pool or lake, but there is also an unconventional way to escape the heat. Introducing the Bradley Fire Hydrant Sprinkler. 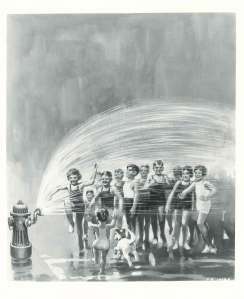 This is a discontinued product for Bradley but Hydrant Sprinklers are actually still relevant today. Commonly thought to be illegal to open, there is a way to go about opening a fire hydrant and enjoying its cool water in a legal manner. Happy Friday! This weekend marks the first weekend of Summerfest here in Milwaukee and I am sure many of you are anxious to start the weekend with music and food down by the lake shore. However, before you take off for the weekend we want to show you a little bit of Bradley history. Like Summerfest, Bradley has been a part of Milwaukee tradition for decades. Pictured below you can see an old advertisement illustrating the versatility of Bradley products between different commercial settings. From corporate buildings, factories, schools, hotels and even Summerfest, Bradley products can be found hard at work. Back in April of 2002 on a block between St. James Street and Mit Stegall Drive in Winnipeg, Canada, you would have stumbled upon a demolition scene that gave the feeling that you were in a post-apocalyptic time. However, on a gray day in April, amongst the rubble, a passerby found something rather interesting. A Bradley Washfountain was the lone survivor of the demolition of the Canada Metal Complex. Flashback Friday: The Bradley sinks. Happy Friday to you all! Check out this week’s flashback Friday photo! Tweet us @bradleycorp and let us know if you recognize anyone in these photos. Happy Friday all! Check out this week's flashback Friday photo. Those fun fixtures reminded me of all the fun that summer will bring. Happy Friday everyone! This week's photo features Barbie. Yes, Mattel's Barbie! The ad, from the early 1960s, uses the different styles and looks that Barbie had to help depict the differences between Bradley's showers. Having Barbie as a "spokesperson," how cool is that? Happy Friday to you all! Hope you had an amazing week. This Flashback Friday, we took it back to the 70's, when knee high socks and bell-bottom pants were a big hit in high schools across the country. And the Bradley washfountain was the groovy place to meet and make plans for the upcoming dance. The good old days. Happy first Friday everyone! April is officially here and there's a high forecast for showers today. Don't forget to grab those umbrellas. Along with the rain showers outside, we wanted to remind you of the Bradley showers inside. Check out this weeks Flashback Friday Photo from the 70's Multi-Stall showers. Happy Friday everyone! As you may know, Bradley has had a ton of bright ideas through the years, from the washfountain to all the washroom accessories. And to commemorate those ideas and this wonderful spring weather, I thought it would be fun to take a trip down memory lane to the 60's when the Bradley Bright campaign first launched. It was a very exciting time, everyone was trying to make a statement. And Bradley was no exception. With the fuchsia background, I couldn't help but notice this ad. And the paisley print in her dress is actually quite mod and chic. I have seen many people walking around in paisley and bright colors lately. I guess some things never go out of style, especially Bradley products.